Departure at 8:30 am from Starhotels Ritz, in Milan. Departure to the hilly area of Monferrato, in the South-east of the region Piedmont. Arrival to Acqui Terme, an old city founded by the Romans famous for its original aqueduct. In the old town, you can admire “La Bollente”, a beautiful white stone structure built to protect the amazing hot spring with water at 75°. After a short walk in the old town, departure to Casale Monferrato, the capital of the ancient Dukedom of Monferrato. The old town includes several beautiful buildings with different architectural styles, such as the Fortress, the Civic Tower and the Cathedral. Free time for lunch and departure in the afternoon to Turin, capital of the region, crossing the North of Monferrato with short stops in Moncalvo, a nice village at the top of several vineyards and Crea, where it is possible to visit the local Monastery, a UNESCO World Heritage. Arrival to Turin, overnight at the hotel. Breakfast at the hotel. Full day dedicated to visiting the town. 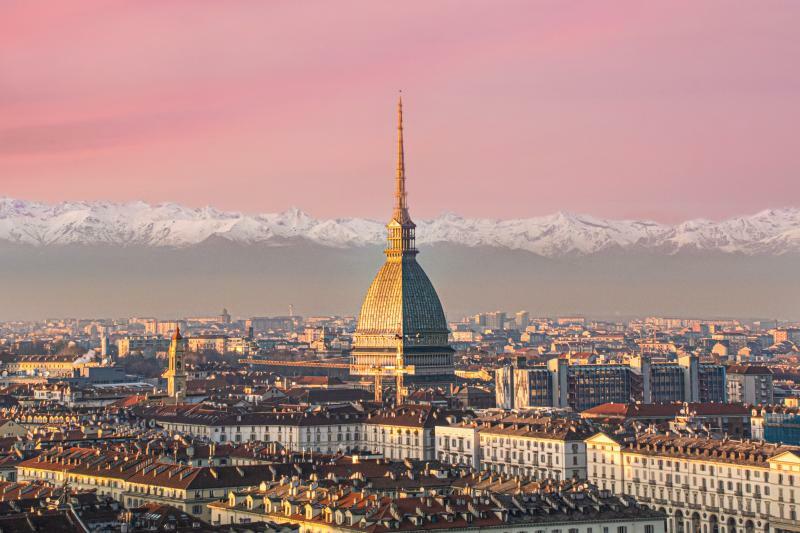 Turin, of Roman origin, the first capital of the Kingdom of Italy, the main centre of car factory FIAT, cultural and university centre, it is nowadays the fourth biggest town of the country for inhabitants and the third for industrial development. In the morning, visit through the famous Savoy Route, including the Royal Palace, in Venaria, the greatest abode of the Royal Family. This imposing structure inspired the French architects during the project of renovation of the Palace of Versailles, near Paris. Built in the second half of 1600 by command of the Savoy Duke Charles Emmanuel that gave it as a gift to his wife, the palace presents the main central building as well as the largest part of the region. Then, continue to Superga, the second hill of the region. Here, visit the Basilica, built at the beginning of 1700 by command of the King of Sardinia, Victor Amadeus II as the dedication to the Virgin in order to celebrate the victory of the Piedmont Army versus France and Spain. Most graves of the family and the unique masterpiece of the Popes pictures, painted on cloth, are conserved inside. Free time for lunch, coming back to the city centre. Breakfast at the hotel. Departure to La Morra, a small village of the Middle Age. It grounds its richness on the so-called “Red gold”, the Barolo. Visit a typical wine cellar in order to taste the best wines of the region. Then, continue to Grinzane Cavour, that houses the homonym castle and some of the main wine bars of the area. There, the first Italian Prime Minister, Camillo Cavour created the myth of the Barolo. In an amazing trip among hills and vineyards, arrive in Alba, a town considered as the capital of the Langhe, district of hills and strong production of wines, known also as the regional leader in the ambit of buying and selling of truffles and chocolates (Ferrero, the multinational factory in the production of tea, chocolate, biscuits all over the world). Founded in the pre-Roman age, Alba had an important role in the Middle Age. Visit of the Cathedral, the old town centre with the road of business, Vittorio Emanuele and Cavour and the City Hall Palace. Breakfast at the hotel. Departure to Fenis to look up to the castle, built in the XII century, located in the highest valley of the region. Built by command of the family Challant because of a reason of prestige, now it represents one of the most charming masterpieces of that age in all Northern Italy. Then, departure to Courmayeur, a small village located at the bottom of the Mont Blanc, the last Italian place before the frontier with France. Entered in the collective imaginary due to its 11 km long tunnel between Italy and France under the Mont Blanc, it presents a unique and wonderful landscape among the best and most fascinating peaks of the Western Alps. Free time in the beautiful old town. Continuation to Aosta, capital of the autonomous region of Aosta Valley, the smallest region of our country, located in the middle of the highest mountains of the Alps.